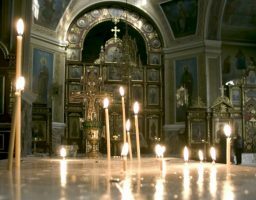 At many of the services of the Orthodox Church, the clergy and faithful pray for the departed souls of those who have gone before us in the Faith. 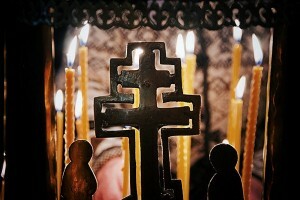 Commemorations for the souls of the departed are offered at the Service of Preparation (called the Proskomedia) before the Divine Liturgy, and at certain times during the year, prayers are also offered during the Liturgy itself, particularly on Saturdays during Great Lent. For those whose parents and grandparents held to the Orthodox Faith, such commemorations are a manifestation of the unity between living and departed relatives – a unity that is found in the Holy Communion of the Body and Blood of Christ. Since such Communion is shared by those on earth and in Heaven, including the saints, this unity provides a great comfort and hope to the living, who might otherwise become overwhelmed with grief or the fear of death. Beyond the commemoration of our own immediate relatives, the remembrance in prayer of the souls of the departed also underscores the family relationship of all those who share in the same Holy Chalice, the Blood of Christ, which makes all Orthodox communicants members of one family, and one race. The evolutionary foundations of modern racism – the concept that God created separate races, and that some races have advanced to a superior level beyond others – is completely foreign to the Orthodox understanding of the relationship between people and cultures. As far as the Christian Orthodox Church is considered, there are only two kinds of people: those who are part of the family of Orthodox Christians, and those who are not, or who are yet to be. Any other understanding comes from the Evil One, the sower of lies and divisions. But what of those who have come to the Orthodox Church apart from their families? For whom can they pray? With whom can they hope to share in the intimacy of the common Blood of Christ? 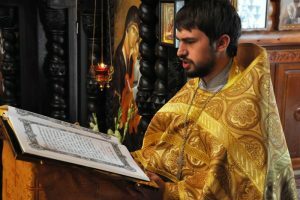 And in earthly terms, how can they avoid suffering from the nationalist arrogance that often afflicts parish life in North America, which can lead those new to the faith or outside her to believe they are alone in not sharing Orthodox ancestors that they know, for whom they can pray on a very personal level? Certainly, Orthodox Christians can and should pray for those they love, for family and friends inside and outside the Church. But what of prayers for ancestors? Are such even relevant for individuals who have converted to Orthodoxy? Clearly, in praying for the departed souls of people in the Church, we do not pray only for those we know, but for those we do not know as well. 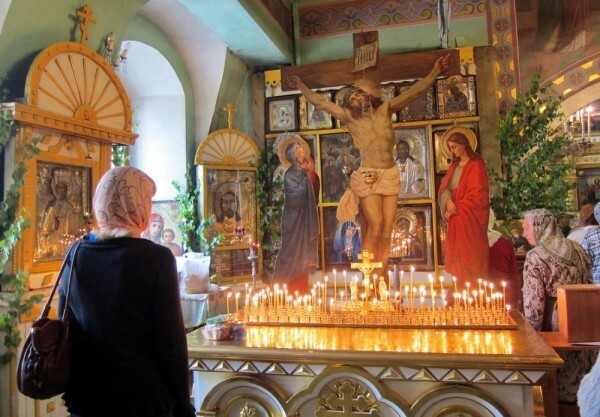 How encouraging it is to see faithful and pious Orthodox Christians taking the time to stay behind after divine services, to join in memorial prayers for the departed souls of people they do not know – those who although strangers to them on earth, would be brothers and sister to them in Heaven. Such a small sacrifice of time is a true example of Christian love. Yet for almost everyone, there are examples of actual earthly relatives who share the same Orthodox Faith, be they known or unknown. For those of Russian, Serbian, Greek, or Arabic background, such Orthodox ancestors are very likely only a generation or two removed, and their names are often known. For those whose families had to flee Communism, the separation may be a whole century – a mere heartbeat in the eyes of God and eternity. For those of Ukrainian or Romanian background, the connection may be a single generation, or it may date back a few centuries to a period of forced divisions of large numbers of faithful families from the Church by the Roman Catholic Unia. For those of Western European descent, for South Americans, Mexicans, Phillipinos, or those of African heritage, the separation may be even one thousand years, back to the Great Schism of 1054. For central Asians, one might have to look back over one and a half millennia to find Orthodox ancestors; their names may be forgotten by us, yet they are known to God. For those North Africans, Indians, Syrians, and Armenians, the connection to the Church of the Seven Ecumenical Councils is farther back still. And what of other peoples? The Church Fathers suggest in a few places, and a variety of contemporary research leads us to believe that even the religions of antiquity, monotheistic faiths predating even Buddhism, Zoroastrianism, and Hinduism, followed rites of worship of the One True God, the Creator of Heaven and Earth, and that their various faiths mirrored closely the common sacrificial rites, prayers, and beliefs of the ancient Hebrews, the forerunners of the Orthodox Church, the New Israel. Much has been written about this fascinating possibility. Prayer for the reposed souls of loved ones grows out of the common love of faithful Christians, across time and place. In so doing, we are united not just with our relatives of the flesh, but with those who share in the same Blood – the Blood of Christ, across time, in Heaven, and on earth. On this question, see the book “Faith of Our Fathers: God in Ancient China”, by Chan Kei Thong with Charlene L. Fu, Beijing: Dong Fang Publishing House/China Publishing Group, and the article “Ancient Chinese History in Light of the Book of Genesis” by Hieromonk Damascene, available at www.orthodox.cn.